As you leave the lift on the first floor, turn right and proceed through the glass door to reception. This area is sunny, discreet, and fully serviced (including water, tea and coffee facilities) from 9am to 5pm. In addition, for your comfort and convenience, we have an additional waiting area nestled next to our historic safe. Our friendly admin staff, will greet you at the reception area. Then you’ll be seen by one of our Registered Clinical Psychologists. All psychologists are highly qualified and actively involved in professional organisations. Our premises are accessible for wheelchairs and for people with mobility problems. 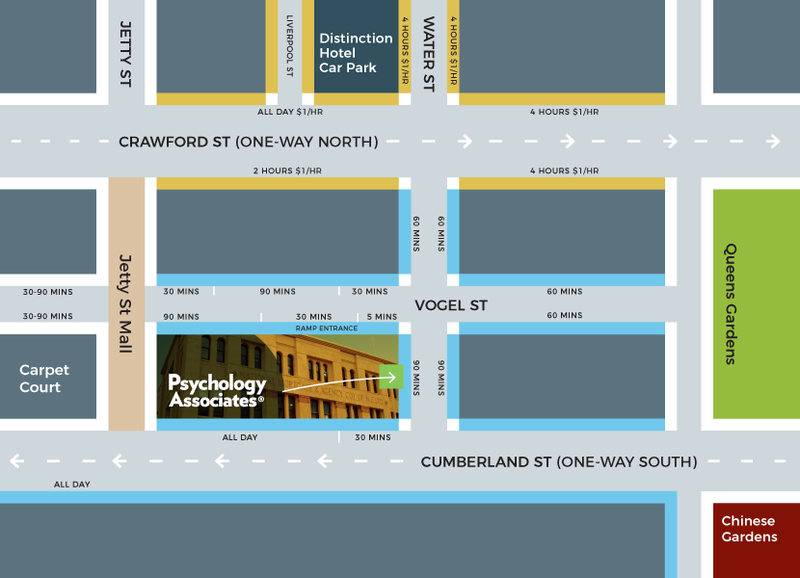 There are 60-minute parking spaces along Water and Vogel Streets, as well as metered parking spaces on Crawford Street just one block away. There is also a parking building one block away at the back of the Distinction Hotel. See map. Ongoing counselling is problem focused and collaborative. Length of treatment is guided by both the client and psychologist. The first one or two appointments will involve you and your psychologist working together towards a full understanding of the current issues for you, and to mutually identify clear areas for change as well as a timeframe for this change. Subsequent sessions will be spent working toward the goals. The next appointment time will be discussed at the end of each session. Most clients make their next appointment with the psychologist at the end of the session. Appointment reminders can be sent out via text or email. Any cancellations or changes of appointments should be done as early as possible to avoid unnecessary inconvenience or cancellation charges. Occasionally an emergency situation arises for the psychologist, and it may be necessary to change an appointment with you. In this case, every effort will be made to contact you at the earliest possible time. From 1 April, 2019, the charges are $184.00 per session including GST. Each session lasts approximately 50 minutes. Short or extended sessions are sometimes arranged, and these are charged proportionately. You will receive an account at the end of each session, for which you should pay the receptionist before leaving. A receipt will always be issued. If payment cannot be made immediately, please discuss this with your therapist. Individual psychologists are happy to discuss whatever payment options might make our work together financially possible. However, any unpaid accounts will be referred to a Debt Collection agency to recover moneys owed, with associated costs added to the outstanding account. Most clients pay for their own therapy. However, some agencies do provide funding, or part funding. Some people are eligible for assistance through various external agencies or through their employer under an EAP scheme. Check with our receptionist for further information. Missed appointments and appointments cancelled within 24 hours will be charged for. Please note that for clients seen under an Employee Assistance Programme (EAP), a missed appointment will count as a session taken.